The Kanas City area's surging labor market took a little bit of a breather in March after seeing robust growth since late 2014. 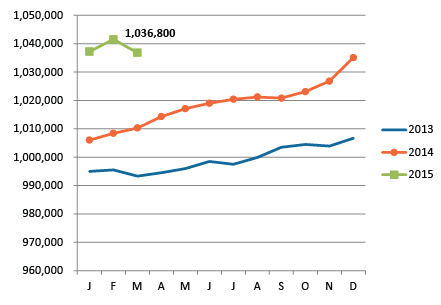 Seasonally adjusted employment declined by 4,700 between February and March and now sits at 1,036,800. 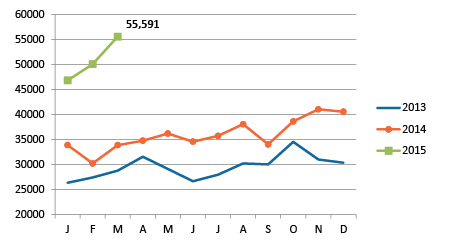 Despite the setback, metro employment is still up by 26,500 from one year earlier. We have had four straight months now where the year-over-year employment growth is greater than 25,000. To put this into perspective, we would have to go back to 1997 to see such consistently strong annual employment growth in our region. It has been a long time coming, but Kansas City finally appears to be creating jobs on a consistent basis. The metro unemployment rate dropped to 5.4 percent, which still leaves us towards the back of the pack amongst our peers. All major industry sectors saw year-over-year growth in employment with the exception of Information, which had only a slight decline. The professional business services industry again leads the region's job growth, with 7,200 net new jobs over the past year. Unique want ads continue to soar into unchartered territory, with more than 55,000 unique help-wanted ads in the Kansas City metro in March, strongly indicating that our employment run will not abate soon. After several consecutive months of seasonally adjusted growth, employment dipped slightly in March to 1,036,800. Kansas City's unemployment rate dropped to 5.4 percent in March. NOTE: We typically use the seasonally adjusted unemployment rates here, but that data series is temporarily unavailable. 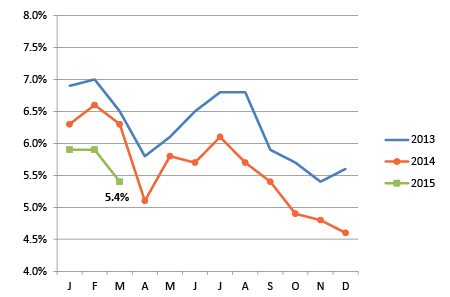 The rates shown below are not seasonally adjusted. 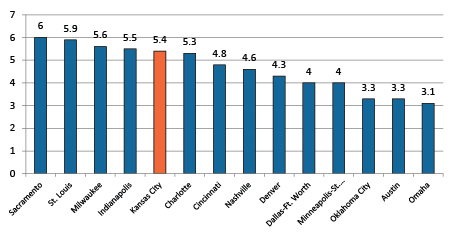 With unemployment falling to 5.4 percent, Kansas City moved up a bit when compared to its peer metros, but is still in the bottom half. Unique want ads continued to climb, up significantly over last year.